Pinkadots Elementary : Manic Monday Freebie, Rajah's Rice, "Hero" vs. "The Nice Guy", blended learning! 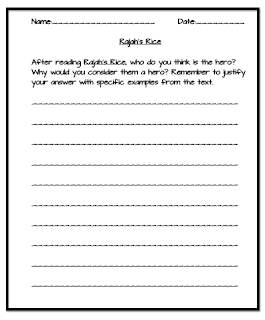 Manic Monday Freebie, Rajah's Rice, "Hero" vs. "The Nice Guy", blended learning! Happy Monday teacher friends! If you checked in with us on our Five for Friday post, you saw we've started our hero unit. I showed you a clip of our worksheet and promised I'd be back with a freebie and explanation...so HERE I am! Robyn and I came up with a fun lesson for the kids to understand whether someone is a "hero" or just being a "nice guy" by doing good deeds. We love incorporating technology for blended learning in our classes and found great resources for this lesson. At the start of this unit the students were asked to write down their hero and why it was their hero. Some examples listed were: Mom (because she packs my lunch), Dad (because he's cool), Grandpa (because he lived without the Internet), Markus "Notch" Persson (the guy who created Minecraft, which my 4th graders are OBSESSED with), pet dog (for listening to me), myself (?? ), the president (for winning two elections), and Eli Manning (for being the best football player alive). I wish i was kidding, but nope, those were actual examples! This led us to the discussion of what makes up a hero, what an idol is, and defining the antonym...a coward. We found a great You Tube video that helped us come up with a specific hero definition. The students recorded the vocabulary and definition in their notebooks. Hero: a character of distinguished courage or ability, admired for his or her brave deeds and noble qualities. Usually makes sacrifices to change other people's lives. Idol: any person or thing regarded with blind admiration, adoration, or devotion. Coward: any person who does not have/show courage in a troubled situation. They might lie, cheat, or give up. We decided a hero should "sacrifice" something in order to help others and/or change someone's life. This led many students to change their thinking (thank goodness) and most understood the difference between an idol and hero. The You Tube video also started the students thinking about doctors, farmers, military personnel, etc. We then checked out a great website, together as a class, called Kids Are Heroes. This website is cool because anyone can nominate a kid, write a description why the person is a hero, post a picture, and the child can be included on the website. We made it our end of school year goal to find a kid-hero to add to the website. You should see my students now...picking up trash at recess, starting clothing drives, and trying to change the world during reading/writing class. They all want to be heroes to be featured on this site. We found some kids on the website that we didn't think were full fetched actual heroes, but instead, just normal kids doing a good deed (well on their road to changing the world and becoming a hero). This led us to our lesson. (If you are still reading this...props to you....I promise it will be worth it!) 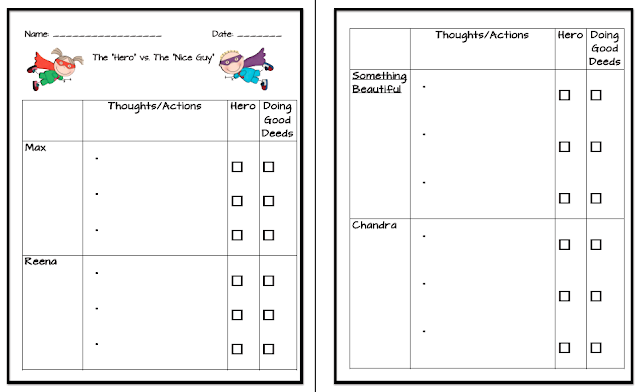 We created this worksheet about two kids on the website Max & Reena. (You can easily do a name search on the site and find their awesome stories. Max is a cutie from our state and Reena's story is just amazing!) Another thing I liked about this website is that kids can send "shout outs" to the kid heroes and there are links for more information or websites on the heroes. We did the first page together as a class. We read and discussed Max & Reena, took notes listing three points (if we could find three) and checked off the appropriate box next to the note. We decided if you checked 2/3 or 3/3 in one column, than the person would fall into that category. After this we moved on to discussing a previously used text. We love using texts over and over as touch stone texts in our class. 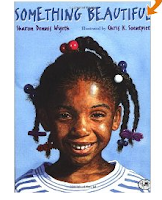 If you find a great mentor text, you can get so much use out of it throughout the year! Something Beautiful certainly falls into that category. The students worked in pairs, with a clipboard and a copy of the book for text reference, to discuss if "the girl" (she doesn't have a name in the text) is a hero or a girl doing a good deed. Next, the students read one of my favorite tales, Rajah's Rice. The main character is Chandra and she is certainly a hero. If you haven't read this book it is such an awesome book on so many levels. 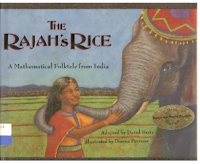 It incorporates a ton of strong character traits, math, beautiful illustrations, and has a great lesson. After the students read this text in their partnerships, they completed the worksheet. I was so impressed with the student conversations and debates taking place during this lesson. The students were VERY engaged and focused the whole time. Finally, when the students finished their partner discussion, they used their worksheet and knowledge from the discussion to put their thinking into words on the final sheet. We took this worksheet as a grade. It incorporated a ton of thinking, discussion, reading, understanding, listening, using text evidence, and following directions to complete. Overall, the kids loved this lesson so much, I wanted to share it with all of you. If you don't have Something Beautiful or Rajah's Rice, check out You Tube, sometimes they are read aloud and you can get away with having your class listen to the story online rather then you reading it to them. Head over to our TPT store to grab the freebie lesson for yourself. Do you have any other stories that show a true hero? If so, please share, I'd love to know what they are! Wow! I love how you made the kids really think about what being a hero means! I will have to go check out those books as well! Thanks for sharing such a wonderful lesson! Awesome post! I've pinned it for next year when I teach the hero unit in my room. Thanks for the freebie and great ideas. I just love coming across posts like this to discover the different ways people and schools are using our website. In the interest of full disclosure, I am Gabe, the proud father of MaryMargaret who is the founder of the Kids Are Heroes website. You mentioned that you thought some of the kids were not actually heroes, just normal kids doing a good deed. If a child is drilling water wells in Africa or simply giving up birthday gifts for an animal shelter, we paint both stories with the same brush. We do this so that we can influence as many children as possible to get them into the spirit of giving back without intimidating them. Some of them "start slow" and once they become heroes on the site they more often than not go onto bigger things for their next project. In our eyes they are all heroes and I can't wait to feature the nominee from your school! Hi Gabe, Such a pleasure to have you comment on our post! I'm so glad you pointed this out because that's exactly what our class has discovered! Although some of the students are not world heroes right now, these kids are on the path to becoming amazing young adults, responsible & caring people, and trying to changing the world for the better. Through this unit study, my students have now found out that by sacrificing anything, even time, these kids featured on the site go above and beyond the call of duty and are wonderful role models to all of us.